On a recent trip to BJs, I made a quick check of the beer aisle to see if they had anything interesting. To my great surprise they had a split case of Sam Adams that included their Noble Pils (see the Wookie’s fine review here). As this beer is soon to disappear from their Spring/Summer lineup, I felt that I had to grab it before it was gone. Sadly, I had decided to share the 4 bottles of Noble Pils with my fellow Booze Dancers, so instead I opened a bottle of Irish Red. Appearance: A little more amber than red. Slight foam that quickly dissipates. An average amount of lacing. Aroma: A lot of malt sweetness from the caramel with a slight hint of hops coming through in the background. Taste: Medium carbonation. Creamy mouthfeel. Rich body and sweetness throughout which is offset by the mild hops flavor leaving a very pleasant finish. 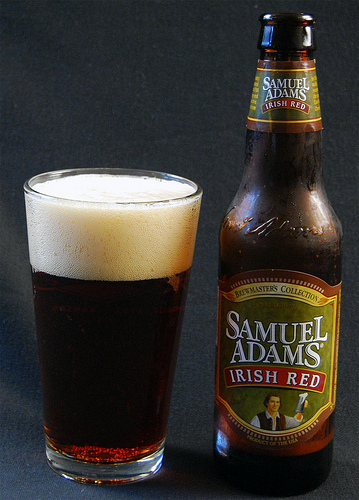 While this beer might not have enough of a slam for a hophead, the heft of a heavier malt or the cache of an import, I found the Irish Red to be a very drinkable beer (the Beer Advocate has it as a B). As we have noted in several other reviews, that seems to be what Sam Adams excels at and here we have another good product. A compliment from the Wookie? I knew if I linked to the Noble Pils review and then dangle a bottle out there like a carrot, I could encourage behavior modification. Now rub my belly and scratch behind my ears!